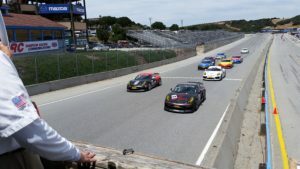 Monterey, Calif. – Dino Crescentini took the overall victory in Race 7 of the Pirelli GT3 Cup USA Trophy in a race that saw several championship contenders exit early as changing conditions at Mazda Raceway Laguna Seca presented a challenge for the racers. On a day that began cloudy and cool, the drivers dealt with rapidly changing conditions through the 50-minute race as the sun came out and the track warmed considerably. 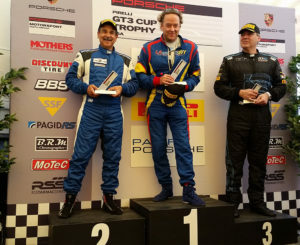 Crescentini took the green flag from pole position and kept his No. 34 Porsche 991 GT3 Cup Car in front the entire race, but was pushed throughout the run by Competition Motorsports’ David Calvert-Jones, who could never quite reach Crescentini. Finishing third was championship leader Robert Todd, driving the No. 52 for hometown team BR Racing. Crescentini earns the victory driving a car wrenched by his son and his son’s two friends. The fledgling team earned a third and a fifth-place finish in the race weekend at Mazda Raceway Laguna Seca three weeks ago and appreciates the concept of multi-class racing. The Platinum Class saw the return of Phil Fogg, Jr., who has not raced since last October. Fogg Jr. started on the class pole and kept his No. 05 TruSpeed Autosport Porsche in front, with Platinum championship leader Tom Haacker taking his Mother’s-sponsored TruSpeed Porsche into second position from a fifth-place starting spot. 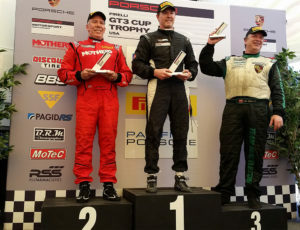 Jim Walsh brought his BR Racing Porsche home in third. The two-car Platinum Masters class split from each other early in the race, but that didn’t mean Ray Shahi missed his own set of adventures, keeping his No. 65 Porsche Newport Beach/TruSpeed Autosport Porsche ahead of familiar rival, teammate Larry Schnur. 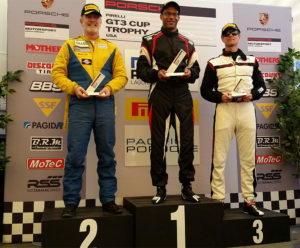 The Silver class for the 2016 Porsche Cayman GT4 ClubSport cars race was a rough-and- tumble affair that saw several challengers – including championship contender Sean McAlister – exit early due to incidents. Pole sitter Kevin Woods, driving the No. 94 BR Racing Porsche, battled with Competition Motorsports teammates Carl Tofflemire and John Horejsi throughout the race and earned his third victory of the season despite brake concerns early on. 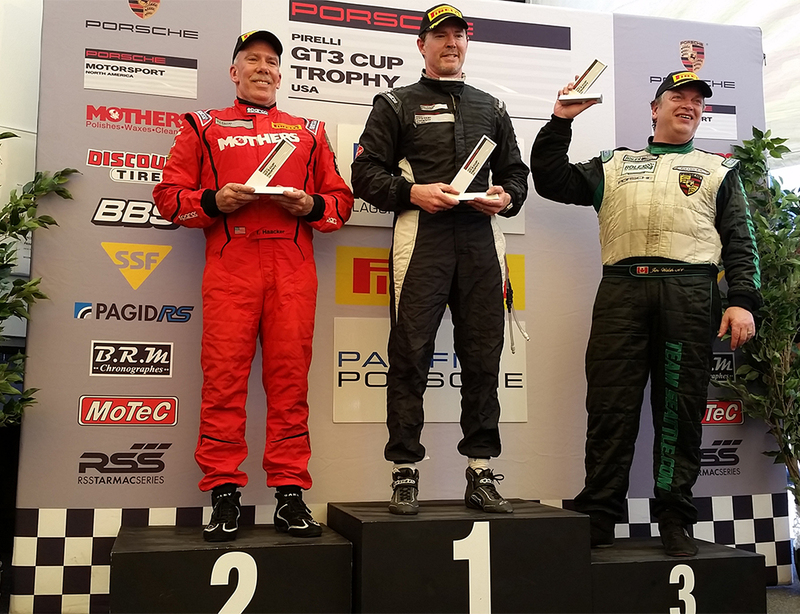 Mike Sullivan took the Silver Masters class victory in dramatic style, as an off-and-on excursion while exiting Turn 5 nearly ended his day. He maintained control, taking his No. 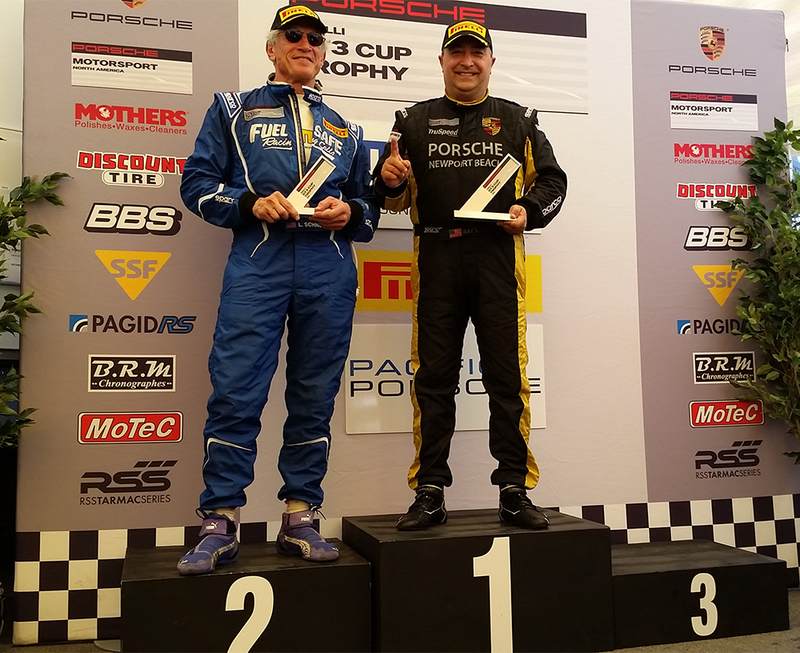 83 Pacific Porsche/LAcarGuy Porsche to the lead when championship leader and Competition Motorsports teammate Steve Goldman suffered a mechanical issue that ended his day. 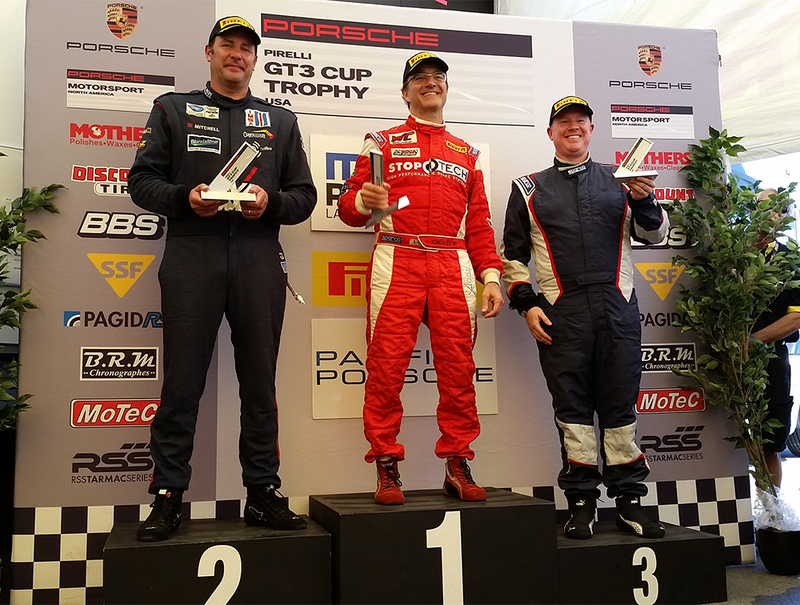 Teammate Chris Vivolo came home second with TRG’s Greg Mitzcik in third. 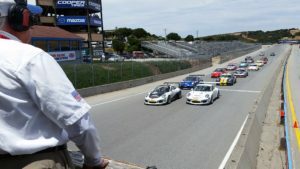 Race 8 of the Pirelli GT3 Cup Trophy USA at Mazda Raceway Laguna Seca is set for Sunday afternoon with the green flag set to fly at 1:50 PM PST. This entry was posted in News on June 4, 2016 by admin.